A couple of months ago, I wrote a four-part series on Larkspur Landing’s parking and access problems. I discussed the possibility of a parking district, a shuttle, transit-oriented development, as well as the constraints on the terminal’s passenger capacity. When the Golden Gate Bridge, Highway, and Transportation District (GGBHTD) called for comment on access to the ferry terminal, I summarized the first two into a two-page letter, complete with cost/benefit table, and sent it to the Board and staff. The Golden Gate Bridge, Highway and Transportation District (District) is in receipt of your letter, dated April 23, 2013, addressed to the members of the Board of Directors, expressing your concerns relative to the “Strategic Vision for the Golden Gate Ferry Larkspur Service (Strategic Vision.” Staff has researched the issues you raise din your letter regarding your assessment of unused parking in the vicinity of the larkspur Ferry Terminal, and your interest in a shuttle from San Rafael Transit Center (SRTC) to the ferry terminal. With regard to parking in the vicinity of the Larkspur Ferry Terminal, the Larkspur Station Area Plan did identify a large amount of surface parking at the various parcels within a radius. However, the examination of that parking was looking in the context of increasing the density of the existing surface spaces. These surface parking spaces were identified for future opportunities to provide for mixed use development and structured parking opportunities. Presently, these parking spaces are needed by the various commercial tenants on these properties. Staff has communicated with various property managers in the area who indicated that their office occupancies are in the low ninety percent range and rising. Although the District did lease some surface spaces many years ago, property managers indicated that they could not consider that possibility at this time, due to their rising demand. With regard to the shuttle form the SRTC to the Larkspur Ferry Terminal, limited parking in the vicinity of the SRTC would be a barrier to its use. 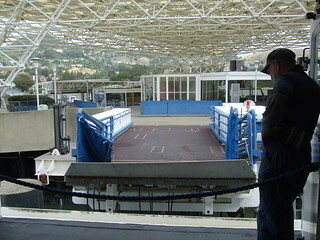 The District operated a midday ferry shuttle from the SRTC to and from the Larkspur Ferry Terminal during 2007 as a demonstration project that, unfortunately, was not successful. Among the reasons cited for passengers not using this service were lack of parking in the vicinity of the SRTC and the inconvenience of using other Golden Gate Transit routes to access this shuttle, due to the need to transfer twice to reach the ferry. As you may be aware, the Board of directors (Board) approved adoption of the Strategic Vision at its meeting of May 10, 2013, with the understanding that staff would bring individual projects forward to determine cost, feasibility and implementation on a case-by-case basis. The Strategic Vision includes both near-term strategies to address current increasing demand, as well as longer-term strategies to allow for the capacity for ridership to continue to increase. Both parking considerations and a possible demonstration project to test the reinstatement of a ferry shuttle route in the Sir Francis Drake Boulevard corridor will be brought back to the Board for review and possible action this summer. Thank you for taking the time to express your concerns and for your interest in the District’s Strategic Vision. I’m glad they took the time to talk with local parking owners, as that would be the easiest way to address the parking crunch, but it’s a disappointment that they were asked whether they’d be willing to lease spaces to the District instead of participate in a parking district. A parking district gives owners control over how many spaces to have available on a daily basis, whereas a lease locks up spaces for years. Though the SMART parking survey showed there would be enough space even with 100 percent occupancy, it’s understandable that parking owners wouldn’t want to risk their parking spaces with a lease. The 2007 shuttle from SRTC failed not because of little parking, though that would be a problem for some, but because it competed with free parking at the ferry terminal. But no matter. 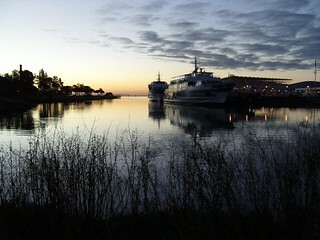 Marin Transit will service the Ferry Terminal via SRTC come next year, and the ferry shuttle along Sir Francis Drake will be accompanied by paid parking at Larkspur Ferry Terminal. Overall, I’m happy the staff took the time to look into the issues I raised, or at the very least to draft a coherent response. It means they are taking public input seriously, and it validates citizen technical activism. That’s a pattern other agencies, especially SMART, should take note of.